I might have to go re-watch some episodes of Scrubs in the near future. I was a huge fan of the show and revisiting many funny moments — and also some very serious and poignant ones — with the cast at the reunion panel was pretty great. And the chemistry and love and respect this group of people had and still have for each other was so apparent in the way they interacted with one another on stage. I always love reunion panels and this one felt really special. Here are some highlights. Bill Lawrence: “The way the show became weird, quite honestly, was we lived in a time that once your show had a very passionate fan base, which you all are a part of, you knew you could stay on for a while. I think when people are enjoying [it], we pledged early on, even if we ever went down with the ship, to do stuff we thought was funny and made us all laugh. I knew we had a really talented writing staff, but also with actors and actresses, I can’t tell you how many lines people have come up to me and said, ˜I really loved that, and I know one of these people made it up on their feet. And you know what I say? ‘Thank you.’ I’m modest. Sarah Chalke: “The fantasies were all of our favorite things to do. I got to make out with the hot ladies like Judy Reyes, Mandy Moore. There was one fantasy where Bill and I, we were so excited, because it was the first fantasy idea to be a nerd, in head-gear with lots of zits and we’re having fun with it. Bill: “This is how TV shows evolve, you guys. We became a family working together and enjoying each other. Ken Jenkins and John C. McGinley had such a good relationship in real life and were such cantankerous antagonists on the show. I really enjoyed the end when we made them friends. Robert Maschio makes a surprise appearance. Bill: “All jokes aside, I want to give a shout out. One of the things that made the show work was that everybody felt that their job, rightfully so, was the most important. Condensed and edited for space and content. If they ever revisit these characters, it will be as a short movie or something and would want to see where everyone is in their lives. 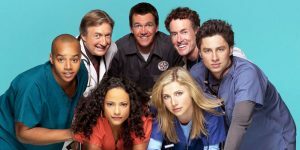 All 9 seasons of Scrubs are streaming on Hulu now.